Dallas Zoo North Savanna Supervisor Lisa Fitzgerald, Assistant Supervisor Allison Dean, and Giraffe Keeper II Jessica Romano guest blog for ZooHoo! 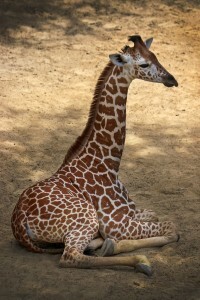 Since 1998 the population of giraffes in Africa has dropped from 140,000 to less than 80,000 individuals. That’s only 80,000 wild giraffes left in the entire world! For comparison, there are more than 1.3 million people living in Dallas and over 200,000 people living in Oak Cliff alone. As zookeepers at Dallas Zoo’s Giants of the Savanna habitat, we take giraffe conservation personally. We think giraffes are amazing and beautiful creatures. 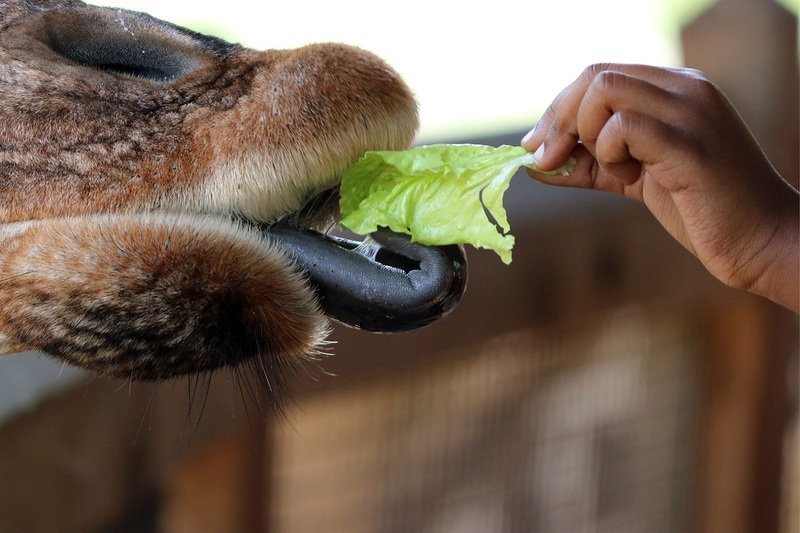 As keepers, we have the privilege of getting to know them as individuals and sharing in their daily lives. As wildlife conservationists, we want to ensure that the four species of giraffes not only survive, but thrive in the wild for eternity. Why has the giraffe population dropped so dramatically? This is largely a situation created by us – humans. Prolonged civil wars in northeast Africa have created large populations of refugees, living in city sized refugee camps. Refugees seek protein sources and giraffes are large, easy targets. Human population growth has also broken wildlife habitats into pieces, splitting giraffe populations into smaller groups that cannot recombine for breeding. 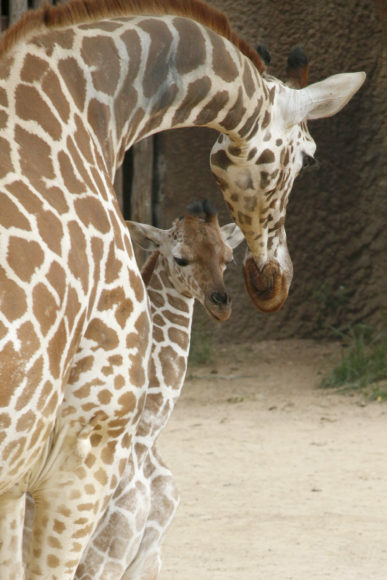 The Dallas Zoo partners with the Giraffe Conservation Foundation (GCF) to provide monitoring of giraffe populations, procure and protect giraffe habitat, and seek workable solutions that identify and relieve threats to wild giraffes. As members and visitors, you help us support GCF’s efforts! Auggie – our oldest giraffe is 14 years old. Also known as “Uncle Auggie” for his gentle and protective approach with calves. Tebogo – our breeder and greeter. Tebogo is the father of the calves born in the Giants of the Savanna. He is people oriented and can be easily identified by his dark brown spots. Jesse – our tallest giraffe. Measuring in at more than 17 feet, Jesse is a total sweetheart and Jade’s BFF. Ferrell – everyone’s buddy and one of our most curious giraffes. He is always keeping a watchful eye on what is going on. Five – a shy guy, but one of our most handsome giraffes. Five has a beautiful brown coat with thin white stripes. Katie – our most prolific mother. Katie is a beautiful giraffe with an even temperament and a slight sassy side. Chrystal – “the diva.” Chrystal is our other mother and likes things her way. Jade – “the princess.” Jade is very particular and sensitive; she likes compliments. 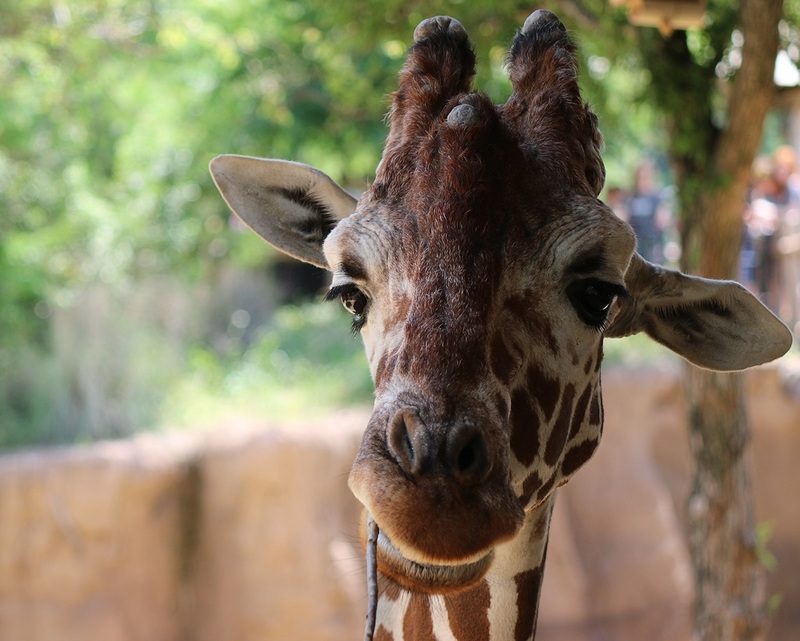 Betty – the “new girl in town.” Betty is our 2-year-old giraffe and has a warm personality when she isn’t getting into trouble. 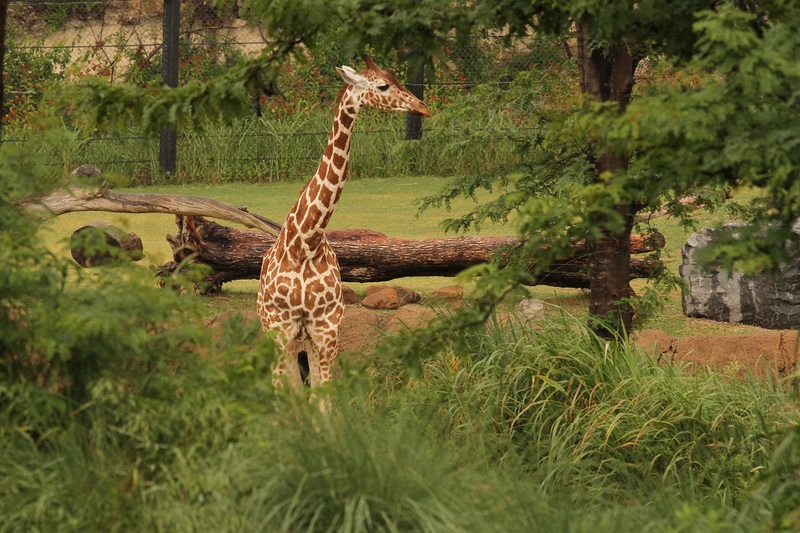 Tsavo – “the baby.” Tsavo is Katie’s third calf here at Dallas Zoo and is the newest addition to our herd. While still growing into his personality, we can already tell he is going to be a lot of fun! He’s got his mama’s good looks and his dad’s rambunctious spirit. Tsavo is quite curious about his keepers and the rest of the herd. When he isn’t following mom around, Tsavo enjoys running and exploring. An affectionate little guy, he likes to nuzzle the other adults and will often give them good morning kisses through the stalls. Tsavo’s already nibbling on bits of browse, and bamboo, in particular, seems to be his favorite. 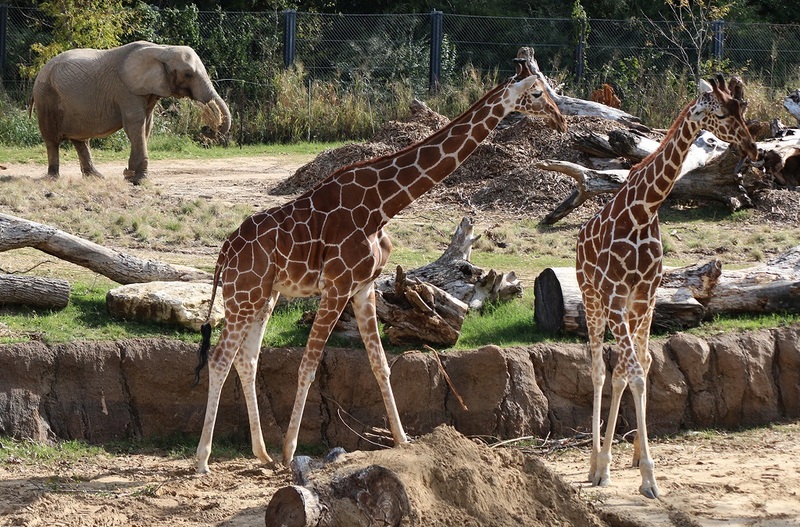 Guests can now see Tsavo out in the giraffe feeding yard with mom and other herd members. Happy World Giraffe Day from the Dallas Zoo giraffe herd and their keepers! Thank you for loving giraffes as much as we do. We are elated to share that our beloved giraffe Katie gave birth to a healthy male calf on Tuesday, May 30, at approximately 1:45 p.m. As of Thursday morning, when the zoo’s veterinary team conducted a well-baby checkup, the almost 6-foot baby weighed in at about 150 lbs. Katie and her new bouncing baby boy are doing very well, following what was a by-the-book, hour-long delivery. The calf has spent his first few days learning how to nurse and following mom around their area. Katie lovingly nudges her new baby boy, born on Tuesday afternoon. Now, at 9 years old, Katie has welcomed three calves with ease – two females, and now her first male. An excellent, proven mother, Katie will remain with her calf for the next few weeks as they bond behind the scenes. The baby will then meet the truest gentle giant of them all – Uncle Auggie. Our oldest and most patient giraffe, Auggie is typically the first to meet new calves. 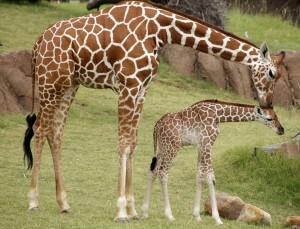 And eventually, the calf will join the rest of the herd in the giraffe feeding yard. We’re giving the honor of naming the baby giraffe to the zoo team that took such stellar care of mom during her pregnancy and are now caring for the newest addition to our giraffe herd. We’ll announce his name prior to the calf making his public debut. 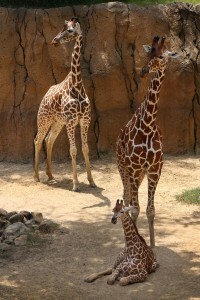 The calf’s father, Tebogo, is one of the most popular giraffes at the Dallas Zoo. 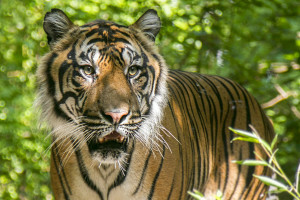 Matched with Katie on an Association of Zoos and Aquariums’ Species Survival Plan (SSP) breeding recommendation, the two were paired together to ensure appropriate breeding and genetic diversity in North America. Unfortunate news hit the giraffe population in late 2016 – the International Union for Nature and Conservation downgraded the species status from “least concern,” skipped the “near threatened” classification, and moved giraffes directly to the “vulnerable” category. In the past 30 years, the giraffe population has suffered a nearly 40% drop due to human encroachment, poaching and habitat loss. It’s believed there are fewer than 97,000 individuals in the wild – scarcer than even African elephants. 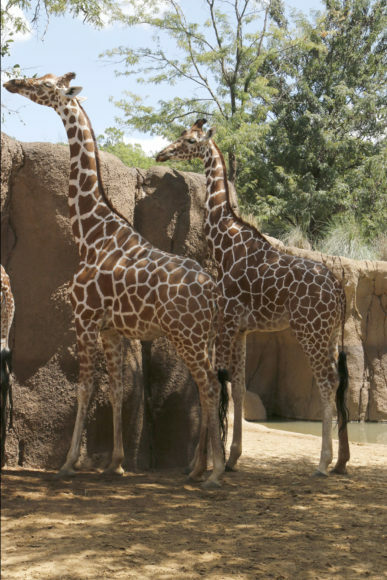 And for reticulated giraffes, the subspecies we care for here at the zoo, only 4,700 remain. This all amounts to what researchers are calling a silent extinction for the tallest and longest-necked animal in the kingdom. 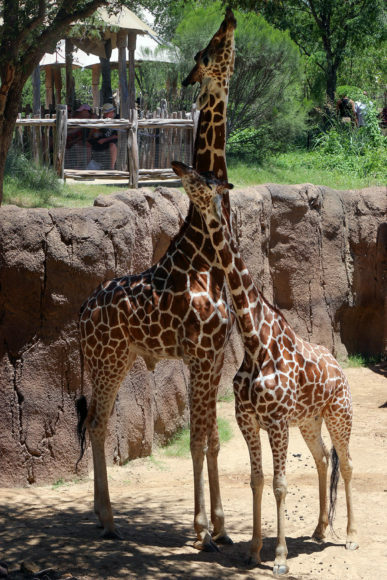 The Dallas Zoo proudly supports the Reticulated Giraffe Project and the Giraffe Conservation Foundation (GCF) by funding efforts to monitor giraffes and remove snares in Uganda. We also help GCF raise anti-poaching awareness in African communities. 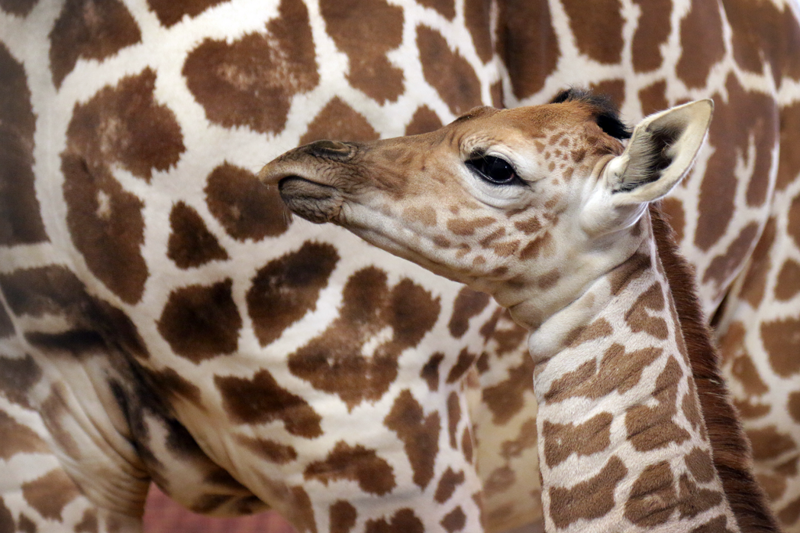 The Dallas Zoo’s new giraffe calf has been active and exploring since just after his birth on Tuesday. How are Katie and the baby doing? Both are healthy and doing very well. The calf has been right on schedule with his activities, standing, nursing, and showing a curiosity to explore – just as we want to see. Was it an easy delivery? Yes, Katie was in labor for less than an hour and all went as expected. When will you be able to see the calf on exhibit? It will likely be several weeks before he’s out on exhibit. Watch the zoo’s social channels for updates. What is the calf’s name? We’ll let you know soon! Once the team here at the zoo decides on the name, we’ll announce it. 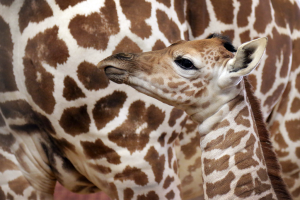 Will the public have a chance to help name the baby giraffe? 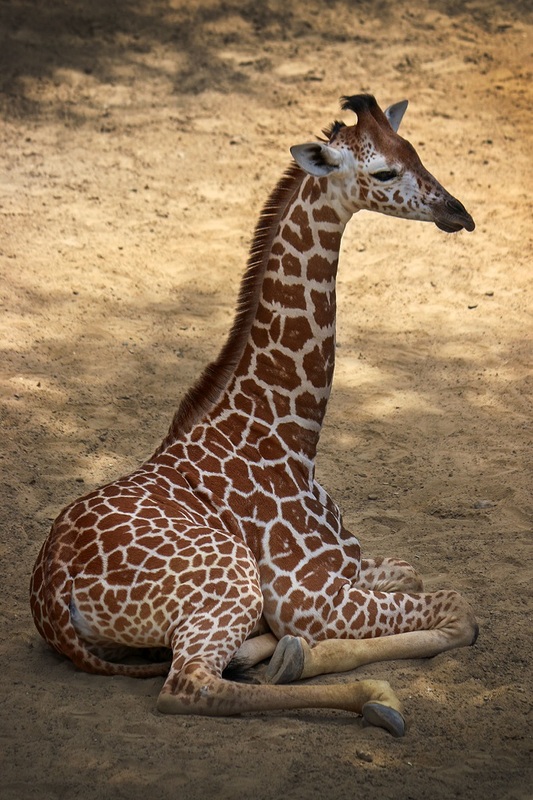 We’re going to give our giraffe team the honor of naming the calf. What has the zoo done to the exhibit to make sure it’s safe given what happened with Kipenzi? We have modified the entry gate system and enhanced the fencing within the exhibit for additional protection for the whole giraffe herd. We believe these measures will help mitigate the possibility of an inadvertent injury in the exhibit. Katie received worldwide attention in 2015 when she delivered calf Kipenzi during a remarkable, first-ever live streamed birth on Animal Planet and Animal Planet L!VE web cameras. 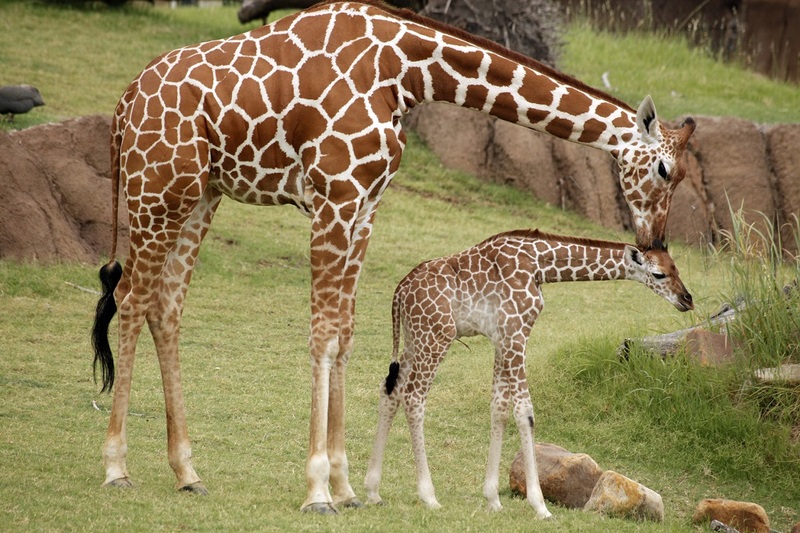 Millions of people around the world fell in love with Katie and her calf – the birth drew more than 2 million streams on APL.tv, and the “Giraffe Birth Live” TV special drew 1.4 million viewers. The live project turned millions into devout, loyal giraffe fans. From admirers making their support permanent with giraffe tattoos, to flying across the world to meet Katie and Kipenzi in person, the impact this mother-daughter duo had was immeasurable. Sadly, Kipenzi passed away in July 2015 following a tragic accident. 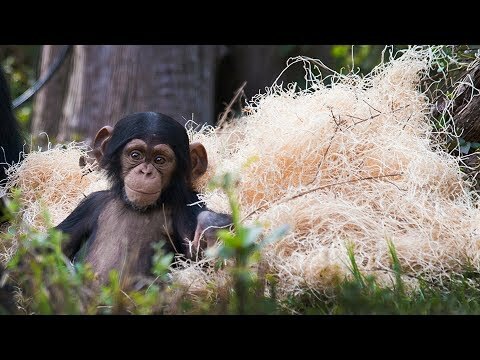 After Kipenzi’s death, the Dallas Zoo and Animal Planet received hundreds of thousands of messages of sympathy and gratefulness for the unprecedented project. An outpouring of support from her fans led to nearly $100,000 in donations for giraffe conservation and other wildlife conservation efforts around the world. Come visit our now 10-member giraffe herd, which roams the award-winning Giants of the Savanna, the only U.S. zoo habitat where giraffes and elephants mingle alongside other African species. In 2015, the habitat was named USA Today’s No. 3 “Best Zoo Exhibit” in the nation. 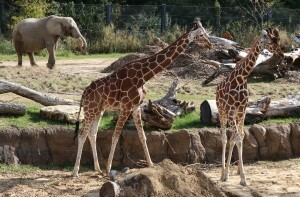 There are fewer giraffes left in the wild than African elephants. Let that sink in. Today is World Giraffe Day, and the earth’s tallest and longest-necked animal is facing extinction, but we bet you didn’t know that. Africa wouldn’t look the same without the iconic giraffe roaming the bush. With fewer than 80,000 giraffes left in the wild — a 40% drop in the past 15 years — seeing these remarkable animals in the wild may not be possible in years to come. • Humans rarely hear them, but giraffes do indeed vocalize. If lucky enough, you can hear them grunting, lowing and bellowing. But most impressively, they vocalize in infrasonic frequencies that we can’t hear. Infrasonic communications carry over long distances. • Giraffes rock one of nature’s most beautiful spotted coats. 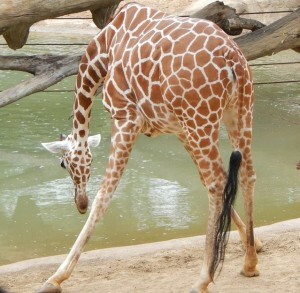 Within all nine giraffe subspecies, each individual’s markings are as unique as our fingerprints. The reticulated giraffe subspecies, which you’ll find at our Zoo, sports a dark coat with a beautiful web of fine white lines. • Despite their distinctive and extraordinary necks, giraffes surprisingly have only seven neck vertebrae – the same number as humans. Each vertebrae is lengthy, measuring up to 10 inches long. • Don’t judge a tongue by its color (said no mom ever). 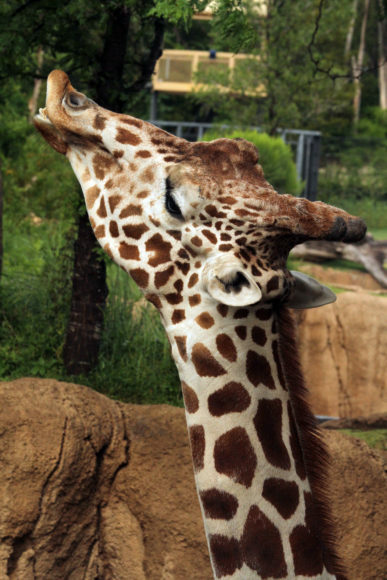 Giraffes’ funky tongues range from black to blue to purple. It’s believed that the dark coloration protects it from sun damage, since they spend the majority of their day eating with their tongues out. Their prehensile tongues can measure up to 20 inches long! • The giraffe’s only living relative is the elusive okapi. 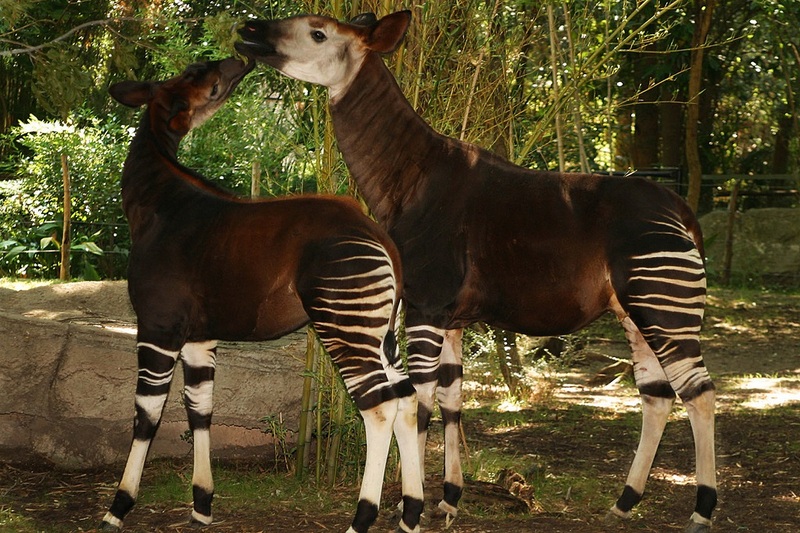 Known as the “forest giraffe,” okapi are only found in the dense rainforests of the Congo. The two species are similar in body shape, although okapi have a much shorter neck. • Their eyes are about the size of golf balls. Mind blown. 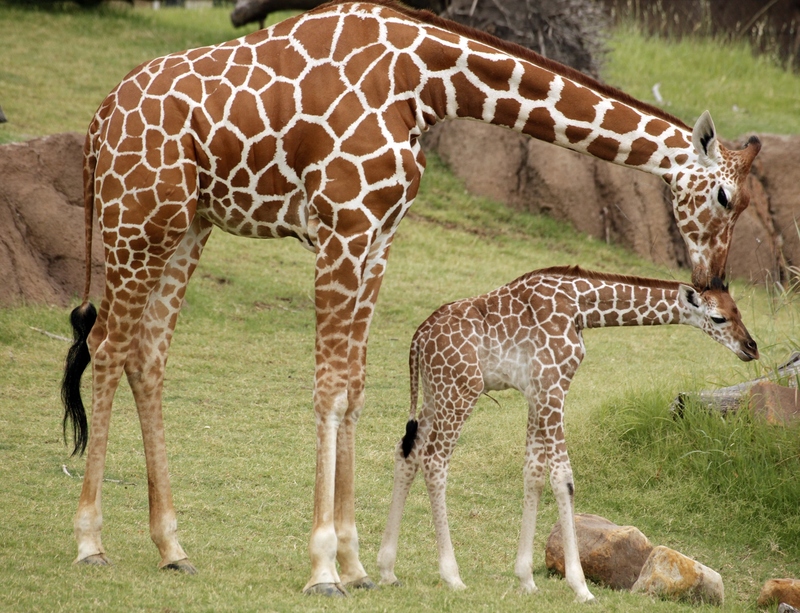 Sadly, giraffes are already extinct in at least seven African countries. 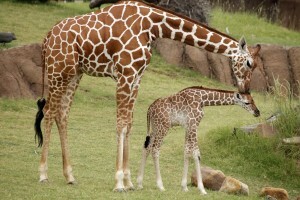 And the Rothschild’s giraffe subspecies is actually more endangered than giant pandas. Africa’s gentle giants need our help. Our partners at the Giraffe Conservation Foundation (GCF) work tirelessly in the field every day to protect these majestic animals. We’re proud to help fund GCF’s efforts to monitor giraffes and remove snares in Murchison Falls National Park, Uganda, home to more than 90% of the wild population of the Rothschild’s giraffe. Learn more about how we’re helping save giraffes with GCF, and please consider donating directly to GCF on this special day dedicated to one of the coolest animals. Forget the flannel, cable-knit sweaters, and scarves – no one knows fall style better than the animal kingdom. 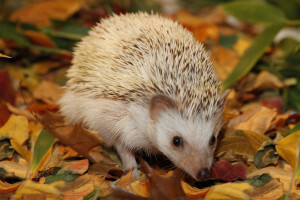 We’re laying down some fall fashion with 10 animals who make this season look better than ever. 1. African crowned cranes rock autumn’s trendiest hairdo like fall royalty. 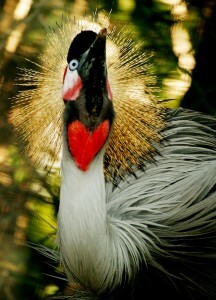 They sport a golden crown of feathers atop their head, distinguishing them from other cranes. Their red neck wattle adds a nice splash of color, too. 2. A creature that resembles a large, ripe tomato deserves a major autumn accolade. 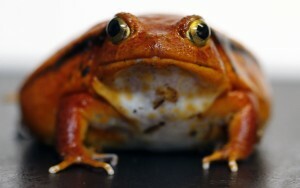 Tomato frogs are brightly colored to warn predators that they’re not good to eat – but we think they’re juicily good-looking. 3. Giraffes’ spotted coats prove nature has a sense of style. Within all nine giraffe subspecies, each individual’s markings are as unique as our fingerprints. The reticulated giraffe subspecies, which you’ll find at our Zoo, sports a dark coat with a beautiful web of fine white lines. 4. Because no other animal can model a bed of fall leaves as adorably as our African pygmy hedgehog. These tiny guys use their coat of spines to escape predators – they’ll curl up into a tight ball and their spines will raise, forming a protective barrier. 5. 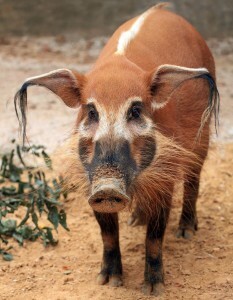 African red river hogs got it goin’ on. From their striking coloration and prominent tassels on their ears, to the hairy white Mohawk running along their spine, these hogs wear fall like no other. 6. Yellow and black has never looked so good. Amiright? 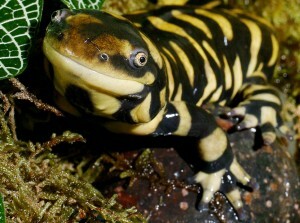 Tiger salamanders’ colors and markings vary throughout their wide North American range, but their most common marking resembles the striped pattern of their big cat namesake. 7. Golden lion tamarins rock nature’s fieriest coat. 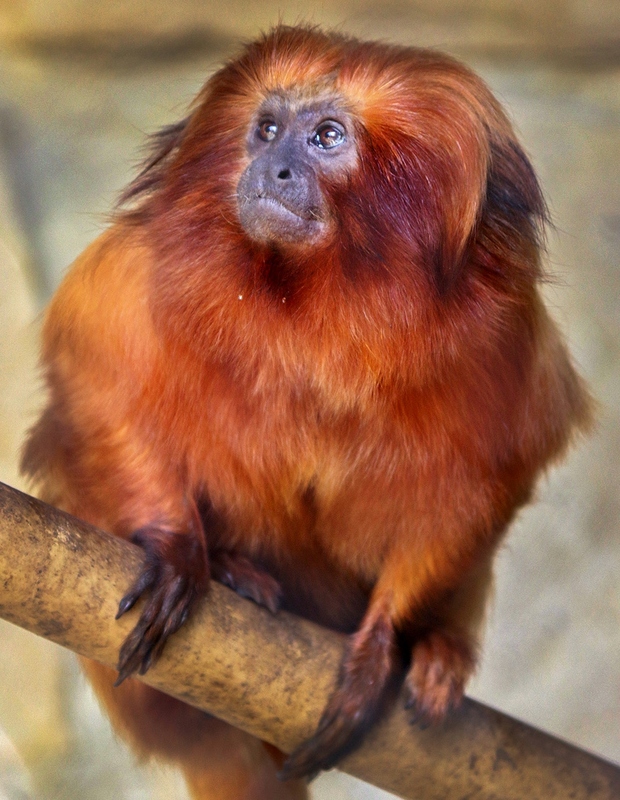 These small monkeys get their name from their vibrant reddish-orange fur and the long hair round their face that forms a perfect mane. 8. 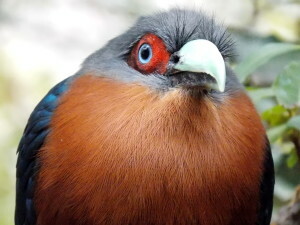 The chestnut-breasted malkoha manages to flaunt every fall color flawlessly. Males and females have near identical plumage, and wear those red eye patches like bosses. 9. Tigers totally own fall. Their symbolic stripes act as camouflage in high grasses or dense forests. 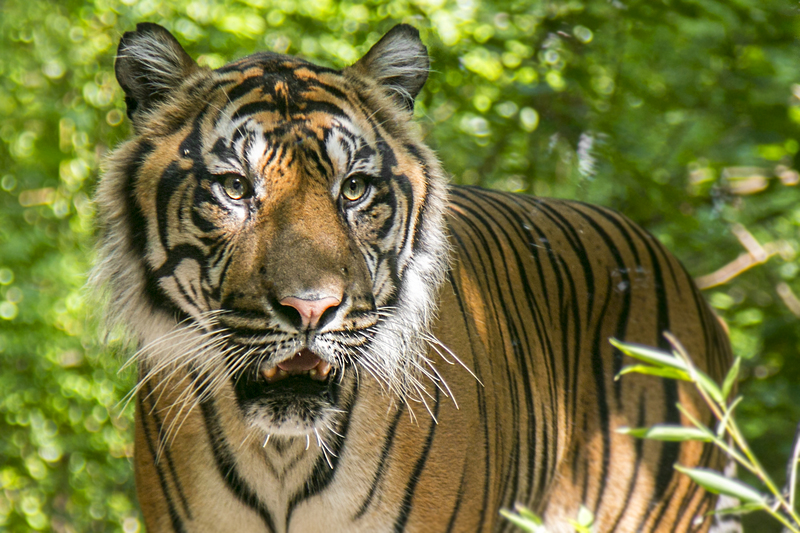 Sumatran tigers, like our boy Kipling, have the darkest orange coat of any tiger subspecies. 10. Thanks to our fall-loving chimps, playing in foliage has never looked so good.